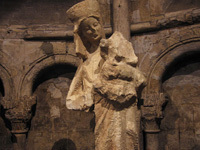 Oh man, there's no way I'm going to even try to write a semi-comprehensive aricle about Notre Dame, because it's so freaking famous and historic and important, and it's already been written about a zillion times. 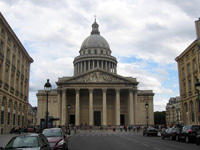 Okay, wait, here you go: "Notre Dame de Paris (French for Our Lady of Paris), is a Gothic, Roman Catholic cathedral on the eastern half of the Île de la Cité in the fourth arrondissement of Paris, France." Haha, I totally just stole that from Wikipedia. Come and get me, coppers! Or, like, les gendarmes, I guess. So what I will give you is a bunch of my personal tips about what stuff to check out when you're there and how to get the most out of your visit! 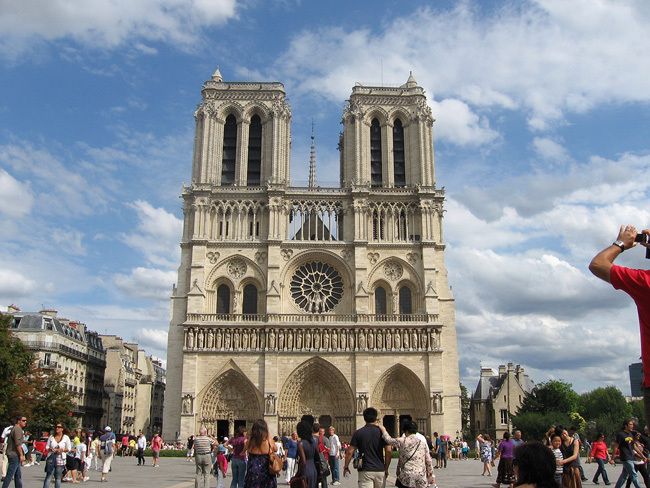 First of all, if you're visiting Paris during the Spring or Summer, Notre Dame is going to be very crowded a lot of the time! Try to go on a weekday morning to beat the crowds. If there's a long line out the front-right door when you get there, it's probably not worth waiting if you're available to come back at a better time the next day. 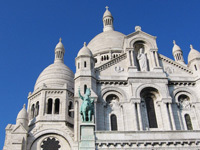 Depending on what you're looking to get out of the place, you can do a quick tour of Notre Dame in as little as fifteen minutes. Tourists file in the right side and stroll along to the back, make the U-turn, and make their way back, exiting out the other big front door. It's not a long walk, but of course most people want to take their time and take everything in, so you might just get stuck moving at the speed of the crowd. I'm really partial to the statue of Jeanne D'Arc (Joan of Arc) about halfway back on the right side, sort of tucked into a corner. If you're looking for her you won't miss her, but if you're not, you'll probably be too distracted looking up at the huge central stained glass windows to notice good ol' crazy Joan. Toward the back of the cathedral, situated in the center of the room (so, on your left when you're walking the first leg of the tour) is a long series of beautiful wood carvings depicting the story of Jesus Christ and the resurrection and everything. These wrap around onto the other side too, so you'll see them when you're walking back through the second half of the tour. It's really fun to state at each scene for a minute and figure out what's going on. Keep an eye out for a spooky little monkey riding on some guy's back (don't ask me who; I don't got much book learnin'). This might sound weird, but I, as a lifelong fan of comic books and sequential art, enjoy any series of images that tells a story; these wooden carvings, Egyptian heiroglyphs, prehistoric cave paintings  to me it's all the history of comics, and telling stories with pictures. I love that stuff. 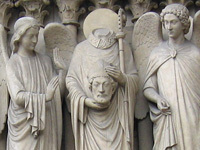 One of my very favorite details of Notre Dame is out on the front facade of the building: There's a great statue of Saint Denis holding his chopped-off head, hanging out with a bunch of other saints, just to the left of the big front left door. Out in front of the cathedral, to the right (if you're facing the cathedral) is a dramatic and impressive statue of Charlemagne on horseback that I really dig. I also recommend walking around to the back of the cathedral and checking out the little park that's back there. If you walk along the left side (left when facing the front of the church) you might get to see some piles of old broken stones and even some broken gargoyles littering the churchyard just behind the fence. If you continue way back behind Notre Dame you can also locate the little (unrelated) Holocaust Memorial that's back there. To find it, head back behind the church, all the way out of the little park, and the entrance will be on the right. You're near the edge of the island here, so you obviously can't overshoot it. Look around and you'll find it. I really recommend visiting this monument if you can; it's a modern art walk-in memorial that's designed to have a feeling remiscent of (while not actually looking like) the inside of a concentration camp; high walls, small raised windows you can't see out of, etc. A pretty powerful experience. 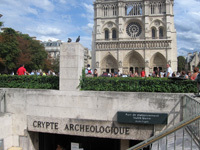 Also, way back out in front of the cathedral, near the front edge of the place, is the the archeological crypt at Notre Dame, which is a small subterranean museum about several layers of civilization that have been excavated under the ground there. When you're in the place out front of Notre Dame, beware of this common but relatively harmless scam: Someone, often behind you, will ask you if you speak English. You'll helpfully say, "Why yes!" eager to be of help to someone who's speaking your own language. You'll turn and see a young person with a sign in English recounting a tale of woe and asking for money. These people usually aren't aggressive (and they often can't really speak English), but it can be annoying to be put on the spot like that repeatedly and have to say no a few times to get them to go away; repeat every twenty feet or so. 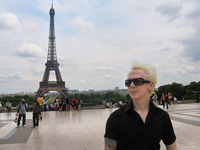 I've gotten myself into the habit of just saying "No" whenever I'm in a touristy area and someone asks me if I speak English (this happens a lot at the Eiffel Tower too). Anyway, as scams go, this isn't one of the meaner or more troublesome ones. Okay, it turns out I had a lot more to say about Notre Dame and the surrounding area than I thought! Have fun!